Pretty neat chart showing the path of an airliner that blew a tire soon after taking off from Los Angeles International Airport a couple months ago. 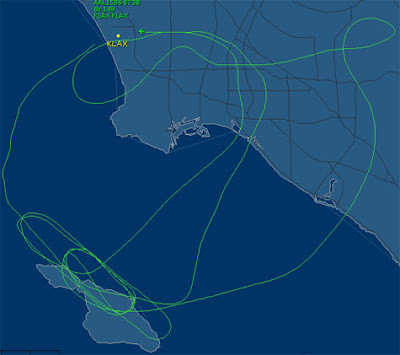 Normally planes would dump fuel so as to lose weight and land more safely; however this plane was a Boeing 737 that does not have that ability and was therefore forced to circle over Catalina Island and Southern California for a while in order to burn fuel. The plane landed back at LAX without incident.